C. Eileen Thiel, R.N. age 102 of Ludington passed away on January 24, 2013 at Oakview Medical Care Facility. She was born in Halifax, Nova Scotia, Canada to Hugh and Agnes Rose (Casey) McDonald on June 23, 1910. Her step-father was Ross C. Myers of Bear Lake, Michigan. She has three brothers: Ross (Virginia) and Wayne Myers (both deceased) and Harold Myers (Mulberry, Florida). She was a member of the Bear Lake High School girls’ basketball team and graduated in 1928. Eileen also graduated from Mercy Hospital of Nursing affiliated with St. Mary’s Hospital of Grand Rapids. Basket weaving, bridge clubs and stained glass were three hobbies that she enjoyed. Eileen married Howard Edwin Thiel on September 10, 1934. They celebrated 59 years together before Howard preceded her in death on November 27, 1993. The family would like to thank Dr. J. Cooney and Oakview’s staff for all the kindness, care and attention they gave to Eileen. In addition, the family would like to thank the Flower Ministry at the Ludington Methodist Church for the many weekly flower arrangements. Surviving is one son Jack (Judy) Thiel; one daughter Margaret (and Howard, deceased) Hansen also of Ludington; seven grandchildren: Lisa Wilson, Mike Thiel, Terry Thiel, and Kristine (John) Gallagher, Brian (Karen) Beebe, Beth (Scott) Baker & Jay (Rebecca) Hansen. In addition numerous great-grandchildren, great-great-grandchildren and several nieces and nephews. A private family memorial service will be held in the spring. The family has entrusted arrangements with Oak Grove Funeral Home & Cremation Center in Ludington. 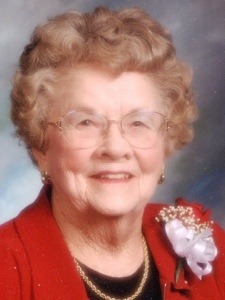 Please visit Eileen’s personal memory page at www.oakgrovefh.com.